What is a primary pathway? 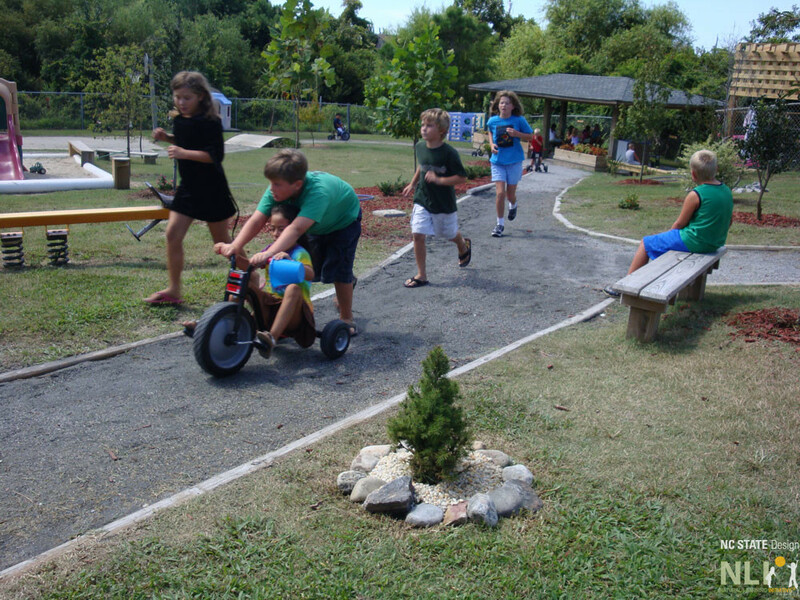 Primary pathways are a functional necessity in childcare outdoor learning environments and promote physical activity by facilitating walking, running, chase games, and wheeled toy use (riding, pushing, pulling). They are designed to provide easy, attractive circulation throughout the outdoor learning environment and to connect classrooms to the primary settings of infant, toddler, and preschool areas. Primary pathways provide spatial structure that simplifies OLE navigation for children. Primary pathways also serve as accessible routes and allow teachers to move quickly through the OLE when necessary. Curvy. Avoid sharp corners, straightaways, and bottlenecks. The inside radius of the pathway should be no less than 10 ft. Gently curving forms integrated with adjacent plantings and other play settings provide an interesting experience and stimulate exploration. Connected to and centered on entrances and exits. Linked to primary play and learning settings and important landmarks. Wide enough to accommodate intense pedestrian and wheeled-toy traffic, helping children stay on the pathway and pass each other without conflict. Located to allow sufficient room for settings and plantings, both inside and outside the pathway. Offset from sand play, walls, ball courts, and fences. Provide a 3 ft. minimum buffer, planted or otherwise, between very active settings (i.e. ball courts), and immovable objects (i.e. fences, trees and walls). Provide buffers between hard surface pathways and sand play to avoid creating slippery surfaces. Smooth and flat. Longitudinal slopes should be gentle to accommodate the safe use of wheeled toys. In extremely flat areas provide positive drainage. A looped and curvy primary pathway at Munchkin Academy, Buxton, NC connects the building to important settings across the site. 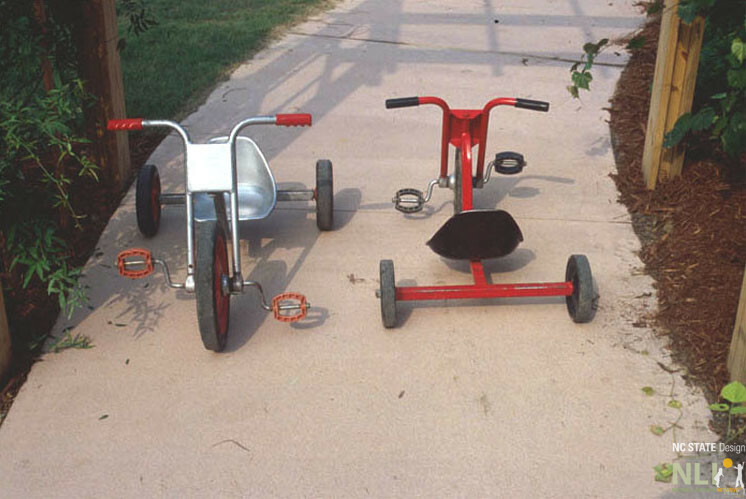 Two tricycles side by side illustrate the importance of primary pathway width.